JAKARTA, Aug. 31 (Yonhap) — Cyclist Na Ah-reum made South Korean Asian Games history on Friday, becoming the country’s first rider to win four gold medals at a single competition. Na is also the first quadruple champion at the 18th Asian Games here, after winning the women’s madison gold medal with Kim You-ri. The tireless one had earlier grabbed two road gold medals — individual road race and time trial — and then moved inside to Jakarta International Velodrome, where she first won the team pursuit title before Friday’s victory. It was one of four medals in track cycling on the sport’s final day. South Korea also picked up silver in the men’s madison and silver and bronze in the women’s sprint. South Korea claimed two more judo gold medals on Friday, with Gwak Dong-han in the men’s under-90 kilogram and Kim Sung-min in the men’s over-100 kilogram divisions reaching the top of the podium. South Korea had five judokas competing for gold medals. The three silver medalists all lost to Japanese opponents. Cho Gu-ham took silver in the men’s under-100kg after losing to Kentaro Iida of Japan. On the women’s side, Park Yu-jin lost to Ruika Sato of Japan in under-78kg, and Kim Min-jeong fell to Akira Sone in over-78kg. This was the final day of individual judo matches. Mixed team matches are scheduled for Saturday. South Korea got its first gold medal from sailing on Friday, as Ha Ji-min won his third straight title in the men’s laser standard event. Also in sailing, the South Korean pair of Chae Bong-jin and Kim Dong-wook won silver in the men’s 49er event, which was first introduced as a medal discipline here. Lee Tae-hoon took bronze in men’s RS:X event to earn his first Asiad medal. The national baseball team reached the gold medal game for the third consecutive competition, following a 10-1 win over China to close out the super round. Cleanup Park Byung-ho homered for the third straight game, as his three-run blast staked South Korea to a 5-0 lead in the fifth inning. Starter Im Gi-yeong held China to a run in 6 1/3 innings. Next up: Japan, which defeated Chinese Taipei 5-0 in Friday’s second super round game to reach the final. South Korea beat Japan 5-1 in their super round meeting on Thursday. The women’s football team finished third by defeating Chinese Taipei 4-0 in the bronze medal match in Palembang, the co-host city with Jakarta. This was South Korea’s third straight bronze in women’s football. Chelsea Ladies stalwart Ji So-yun scored the match’s first goal, and three other players contributed a goal apiece in the easy victory. South Korea will try to win bronze in women’s volleyball, after the defending champion lost to Thailand in the semifinals. South Korea, world No. 10, will have to overcome the sixth-ranked Japan in Saturday’s bronze medal match. South Korean men’s handball team also won bronze with a 24-23 victory over Japan. Hwang Do-yeop had a team-high six goals, while two other players contributed four goals each. Lee Hyeon-sik’s goal with 2:33 left gave South Korea a 24-21 lead. Japan came back with two goals, the latter of which came with 45 seconds remaining, but South Korea held on for the nail-biting win. 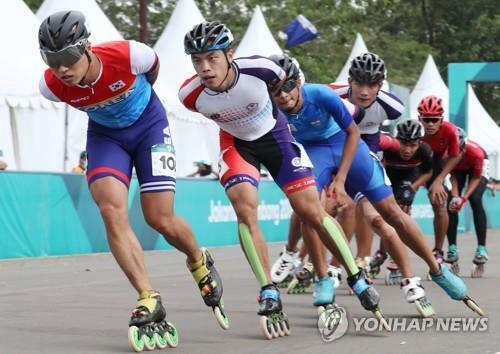 In roller skate, Choi Gwang-ho and Son Geun-seong picked up silver and bronze medals in the men’s 20km road race. Choi finished his race in 33:51.653, 0.235 second behind the champion, Chao Tsucheng of Chinese Taipei. South Korea also picked up silver and bronze in the modern pentathlon, as Kim Se-hee and Kim Sun-woo finished second and third in the women’s individual event. Zhang Mingyu of China won the gold with 1,375 points, 25 ahead of Kim Se-hee and 27 better than Kim Sun-woo. In diving, Kim Su-ji was the women’s 1m springboard bronze medalist. South Korea has won two silver and two bronze medals in diving so far, with the women’s 3m springboard and men’s 10m platform left on Saturday. There are two days left of competition, though the final day will only feature triathlon’s mixed event final. South Korea now has 43 gold medals, well short of its target of 65, and trails Japan by 26 in third place. The last time South Korea finished behind Japan in the Asian Games medal race was in 1994, when the Japanese city of Hiroshima hosted the event. Unless South Korea stages a dramatic rally over the next two days, it will also fail to reach the half-century mark in gold medals for the first time since winning 28 in 1982.